It all played out like the most clichéd sports movie you’ve ever seen. The Tigers trailed the Yankees by two runs in the ninth inning. Two outs, two strikes, man on second. Mariano Rivera reared back to throw his unhittable cutter. This time, the batter did hit that unhittable pitch. Just not the way he wanted. and fouled another 93 mph cutter right off the same knee. and watched it crash into the net over the center-field wall, the one protecting Monument Park. As Cabrera rounded the bases, the cameras caught Rivera’s reaction. “Wow,” mouthed the greatest closer in baseball history. It’s a shame the players posthumously honored with those big, red granite blocks in Monument Park weren’t around to express their own reactions. Given what Cabrera has done this year, Babe Ruth, Lou Gehrig, and Mickey Mantle might’ve tipped their caps, acknowledging that rarest of breeds: a true peer. Pick your favorite superlatives and they won’t properly express what Cabrera is doing to the league. You might remember that last season, Cabrera became the first player in 45 years to win the Triple Crown. Though he’s a long shot to repeat that feat this year, Cabrera has actually improved dramatically in 2013. The homer off Rivera was the first of two in two straight at-bats against Mo, which in and of itself is stupefying. Cabrera finally had a streak of four consecutive games with a home run snapped Tuesday, leaving him with 37 for the year. But even after an 0-for-5 day against the White Sox, Cabrera is putting together one of the best seasons by any hitter in baseball history. FanGraphs tracks a stat called Weighted Runs Created Plus, which tallies a player’s offensive contributions, then adjusts for park and league effects; 100 is league average, meaning an 80 wRC+ would be 20 percent worse than league average, while 120 wRC+ would be 20 percent better. Cabrera’s outrageous line of .362/.456/.683 translates to a staggering 207 wRC+. That’s tied for 20th among the best offensive seasons of all time. Put a different way, only seven players have ever put up better numbers over a full season: Barry Bonds, Ruth, Ted Williams, Rogers Hornsby, Mantle, Gehrig, and a 19th-century player named Fred Dunlap, who put up his huge year while playing in the Union Association, essentially a glorified minor league. We’ve got more stats that will help thrust Cabrera’s monster season into context. But first, the power of Cabrera’s seemingly effortless swing and his ability to crush pitches that most players shouldn’t even try to hit demand some visuals. We’ve got lots of those. Of all the jaw-dropping things Cabrera has done this season, the one that sets him apart from even other top hitters is his otherworldly ability to destroy inside pitches. 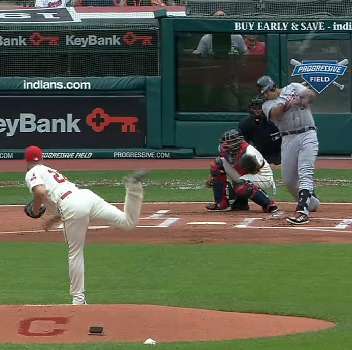 Nobody in the game rotates his hips and whips his hands through the hitting zone faster than Cabrera does. On Saturday, he hit a home run off Yankees starter Phil Hughes on a fastball that was so far inside, it was in the batter’s box. 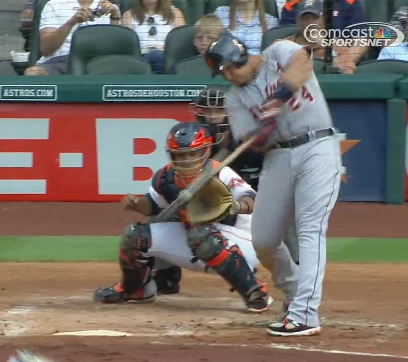 This marked the fifth time Cabrera has cranked a home run on a pitch six or more inches off the plate inside. The first of those home runs happened May 4 against the Astros. Facing right-hander Lucas Harrell, Cabrera got a 93 mph fastball way inside. The screencap seems to show a player straining just to make contact: Cabrera dipped his shoulder way down, and it looks like he’s bringing his hands in just to fight off the pitch. But the end result tells a different tale — a 396-foot home run to left. except for Cabrera, who walloped the pitch 423 feet, over the center-field fence. Oh, and it was his third homer of the night. into the stratosphere (or 412 feet away, anyway). Two weeks later, Cabrera battled one of the best starters in the American League, James Shields. This was another first-inning matchup, and another fastball (92 mph) that skirted the edge of the batter’s box. 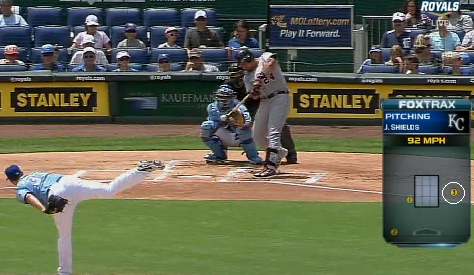 Cabrera mashed this one down the left-field line for a 424-foot bomb. Tally up Cabrera’s onslaught of homers on inside pitches, as well as some shots on pitches that were too low, too high, or outside, and you get a hitter who has hit nearly twice as many home runs on pitches out of the strike zone as has his closest competition. 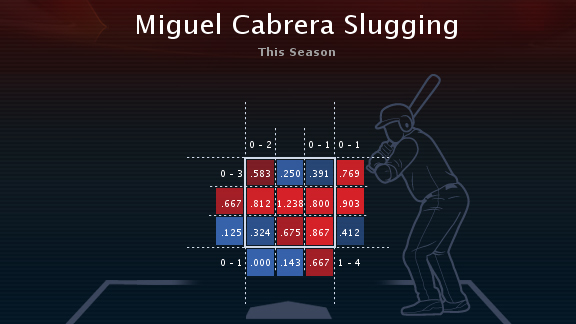 Finally, check out this heat map of Cabrera’s slugging percentage on pitches in various locations. Slicing and dicing into this many spots does introduce small sample size issues. Still, check out those red boxes inside and off the plate, and ask yourself, how is this even possible? If you’re shaking your head at Cabrera’s ability to turn potential HBPs into towering home runs, you’re not alone. ESPN’s Curt Schilling, a Hall of Fame–caliber pitcher who faced off against dozens of terrifying sluggers during the height of the PED era, is equally blown away. “This, this very thing, is what separates the goods from the greats, and the greats from the Hall of Famers,” Schilling said. “Good players hope to be able to fight this off to live for another pitch. Great players occasionally fight this off and fist a single. Hall of Famers — Miguel, Manny Ramirez — hit this pitch into the nacho stand. The ability to bring your hands this far in, and get the barrel of the bat not just to it, but through it, are once-in-a-generation things. When you talk about being able to do it at 97 mph, well, you just can’t do that. No one can but this guy. OK, this wouldn’t be a Grantland/ESPN Stats & Info joint without some shiny numbers. First, let’s quantify Cabrera’s results on balls in play. The stats service Inside Edge tracks a metric called well-hit average. It’s exactly what it sounds like — the number of well-hit balls per at-bat. The thing is, BABIP doesn’t happen in a vacuum. Not all balls in play are created equally, and we know that when a hitter swings at pitches that are easier to hit, his BABIP will be higher. The league-average BABIP is .296 this season, but it’s .303 on pitches in the zone, versus .272 on pitches out of the zone. So last year, of Cabrera’s 578 non-homer at-bats, 365 ended on pitches inside the strike zone (63 percent), and he had a .367 BABIP on those pitches. This year (through Monday), he has upped that rate to 71 percent of non-homer at-bats ending on pitches in the zone, on which he’s produced a .378 BABIP. Cabrera is also being slightly more selective. His swing rate has edged up to 52.5 percent from 50 percent last year, but he’s chasing 33 percent of pitches out of the zone, versus 33.9 percent last season. He’s striking out about as often as he did last year, but with a league-leading 14.1 percent walk rate. Cabrera walked just 9.5 percent of the time in 2012, a massive drop from his 15.7 percent rate in 2011, one you might attribute to Cabrera getting challenged more often with Prince Fielder hitting behind him. But this year, Cabrera is actually seeing a slightly higher rate of pitches in the zone (42.6 percent in 2013 versus 42.5 percent in 2012), and still managing to walk more. The biggest difference has come on three-ball counts. Last year, Cabrera chased on 39 percent of pitches in three-ball counts (50th in AL); this year it’s just 19 percent (best in MLB). 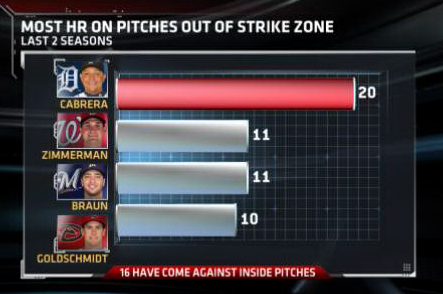 In short, Cabrera has commanded the strike zone better than just about anyone in the game this year. He’s looking for his pitch, and when he doesn’t get it, he doesn’t swing. It just so happens that his pitch can sometimes be a mid-90s fastball nowhere near the strike zone. There’s more. Cabrera has taken his performance against sliders and curveballs to a new level, hitting .331 with a 1.063 OPS in at-bats ending with those pitches. Last year he batted .266/.808 against them. Again, pitch recognition has played a big role. Last year, he chased 40 percent of breaking balls that came in below the strike zone; this year he has offered at just 32 percent of those pitches. Just don’t mistake selectivity for a lack of aggression: This year, Cabrera has swung at the first pitch 42 percent of the time (the highest rate in the AL), and he’s absolutely hammering the ball when he puts first pitches in play. 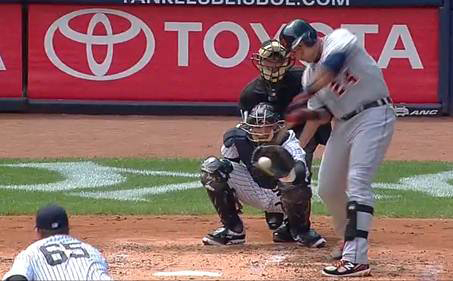 Cabrera’s home run on Monday came off a first-pitch 96 mph fastball from Chris Sale. That was his 11th homer on the first pitch this season, which leads the majors and ties his career high, set in 2005. As we established in last year’s MVP debate — or really by watching any Tigers game — Cabrera is not perfect. He’s glacially slow, even slower now that he’s dinged up. He has made a fair number of good plays at third, but has also shown terrible range, especially on balls to his left, making him a clear minus defensively (that might be a column for another time — we’ve got lots of data there too). Still, these are nitpicks in the grand scheme of things, like complaining about the Sistine Chapel because you’ve got a smudge on your glasses. Cabrera is the best hitter on the planet, he’s riding one of the best offensive seasons we’ve ever seen, and he’s demolishing balls that could practically hit him if he let them. Let us stand back in wonder and enjoy. William Cohen is a production researcher for ESPN’s Stats and Information group. He regularly supports ESPN MLB broadcasts with statistical information as well as working on studio shows Baseball Tonight and SportsCenter.